How to use Shungite rubble – Water activator guide. Home/Related Articles/How to use Shungite rubble – Water activator guide. 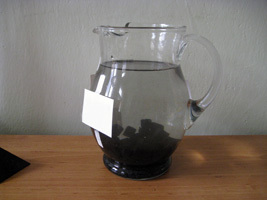 To prepare shungit water use a glass jar. 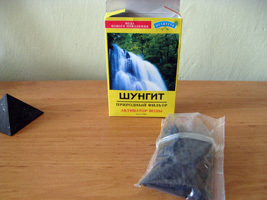 Use 1 pack of shungit rubble for 3 liters of water. Make sure the jar is clean and put the package content inside. Fill the tank with tap water or water from a well (water from PET bottles is not convenient - it is "dead") - in the appropriate ratio. Water is cloudy now. 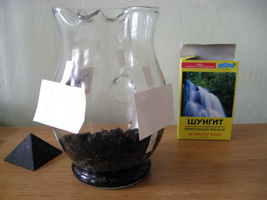 Leave the jar overnight and the following day pour out water from the container and fill it again. Leave the jar overnight again and then remove last finest particles from the water surface. Water is now ready to drink. 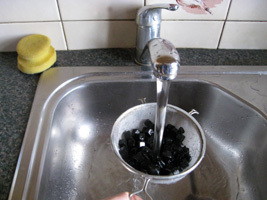 When using the water always keep the minimum level of water so the rocks are under water. After approximately three months or sooner (depending on the quality of your water) put the shungit rubble into a wire sieve. Under a stream of hot water shake and move with the sieve - the rubble will be cleaned. Then do the same under cold water. Return the shungit rubble to the jar, fill it with water and leave overnight. Then you can use the water again. shungit water can be used not only for drinking - use it for cooking, preparation of tea, coffee, ice production, washing, you can do tests on your pets (two same pots, one with shungit water, one with ordinary water) - which pot do they choose?, etc. for cleaning choose a sunny day. Remove the rubble from the jar, place it on a white pad (preferably canvas - for easy manipulation), pour the rest of the water through the canvas, including rubble. Leave the canvas with rubble on the sun until it is completely dry and charged from the sun energy . Then clean the shungit rubble with a sieve as described above. Any of your comments and suggestions are welcome.